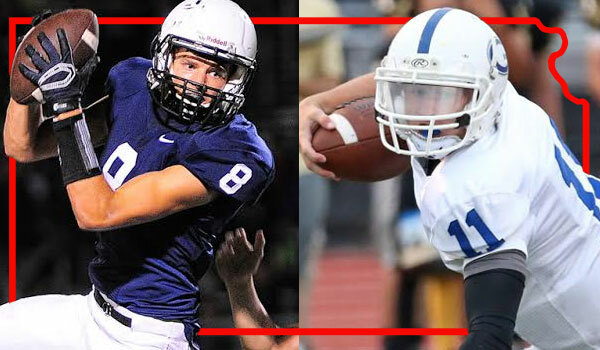 L to R: Mill Valley WR Ben Hartman (by Don Austin) & Goddard QB Blake Sullivan (by David Jackson). The Mill Valley Jaguars (8-4) will attempt to defend their Class 5A crown when they meet the Goddard Lions (11-1) in the state championship on Saturday at Pittsburg State University’s Carnie Smith Stadium. But the opportunity to defend their title may have appeared unlikely about a month ago. In mid-October, the Jaguars held a 3-4 record after dropping four consecutive games to Blue Valley, St. Thomas Aquinas, Bishop Miege and Blue Valley North. The luxury of hindsight provides understanding of how difficult that four-game stretch was for Mill Valley, which was in its first season in the ultra-competitive Eastern Kansas League. Blue Valley is in the 6A state championship, Aquinas reached the 5A semifinals, Miege is in the 4A Division I title game, and Blue Valley North advanced to the 6A quarterfinals. Goddard coach Scott Vang certainly isn’t overlooking the Jaguars because of their 8-4 record. The Jaguars, who beat Bishop Carroll 35-14 in last year’s championship game, also graduated an abundance of talent. Among the departures were quarterback Logan Koch and Kansas Gatorade Player of the Year, Christian Jegen. The Jaguars returned only four starters on offense and two on defense. Mill Valley is on a five-game winning streak since the four-game lapse. The Jaguars rebounded with a 28-21 win over Gardner-Edgerton before topping KC Sumner, Blue Valley Southwest, St. James Academy and Aquinas in the playoffs. Last week’s 14-13 win over Aquinas avenged a 40-33 regular-season loss. The Jaguar defense forced five turnovers in the victory. Joel Donn, a senior, paces the Mill Valley defense with 177 tackles, including 107 solo. Dylan Smith has posted 105 tackles. Junior Ike Valencia leads the pass rush with 5.5 sacks. Donn recorded 25 tackles during last week’s win over Aquinas. Offensively, junior quarterback Brody Flaming has filled the void left by Koch. Flaming has passed for 2,497 yards and 28 touchdowns while rushing for 1,175 yards and six touchdowns. Sophomore Cameron Young leads the Mill Valley rushing attack with 1,493 yards and 13 touchdowns on 240 carries. Ben Hartman is the top receiver with 59 catches for 911 yards and 12 touchdowns. Logan Talley has added 50 catches for 623 yards and eight touchdowns. Keegan Zars, a 6-foot-5, 295-pound senior, is the leader of the offensive line. Goddard will play in the state championship for the first time since 1988. The Lions have won 10 games in a row since falling 35-6 to Derby in Week 2. Derby, the defending 6A state champion that is back in the title game, defeated Goddard in a game that lasted only one half because of inclement weather. Despite the lopsided loss, Vang said the game was evidence the Lions could play with top-tier talent. “Our kids learned they were athletic enough and physical enough to play with teams like Derby,” he said. Goddard cruised through its next seven games, winning by no fewer than 35 points. During the past three weeks, the Lions have notched notable victories over Bishop Carroll (20-12), Wichita Heights (28-14) and Great Bend (50-21). Goddard junior quarterback Blake Sullivan has passed for 1,550 yards with 27 touchdowns and five interceptions. Sullivan has also rushed for 1,254 yards and 15 touchdowns. Kody Gonzalez leads the Lion rushing attack with 1,672 yards and 16 touchdowns. Owen Beason (28 rec., 456 yds, 8 TDs) and Jordan Cooke (26 rec., 432 yds, 6 TDs) are the leading receivers. The Goddard defense has held opponents to two touchdowns or fewer eight times. Ethan Wright leads the Goddard defense with 102 tackles and 5.5 sacks. Ian McSwain has posted seven interceptions. "It’s going to be a physical knock-out, drag-out game,” Vang said.